Home > News > Cannabis impairment: Is your workplace safe? Chris Moore of the Canadian Center for Occupational Health and Safety. The Bluewater Wood Alliance used part of its quarterly networking meeting in Burlington on Nov. 21, to spread some important information about Canada's new cannabis legislation and how it might impact your workplace. 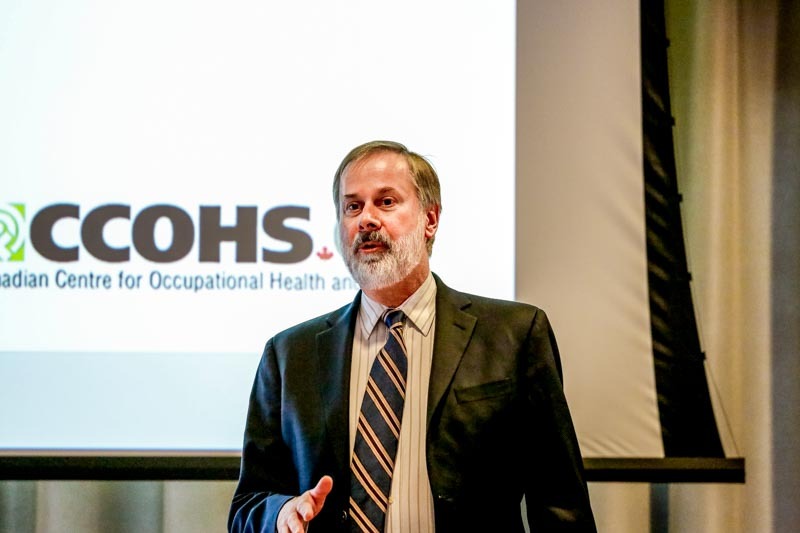 Guest speaker Chris Moore of the Canadian Centre for Occupational Health and Safety, talked to participants about some of the issues resulting from, and to raise awareness about how to effectively manage policy in the workplace following the recent legalization of cannabis. In essence, while cannabis consumptions can be proven through blood tests, there is no test at this time that proves actual canabis impairment. Sure, police officers and a few others have and will be trained to assess impairment - just like the old roadside sobriety tests predating breathalyzers. However, employers have no way to prove even if they observe someone smoke or otherwise consume cannabis, that that person is inded impaired. However, even though there is no proof, companies must nevertheless have policies in place addressing cannabis comsumption and clearly post and share that policy with every employee. Failure to do so may well result in an insurance nightmare, never mind potential injuries and worse. It's part of their due dilligence and an employers' duty to provide a safe ans healthy workplace. Staff trainig and education are paramount Moore said. For more information, we recommend downloading CCOHS's White Paper dealing with cannabis legalization.